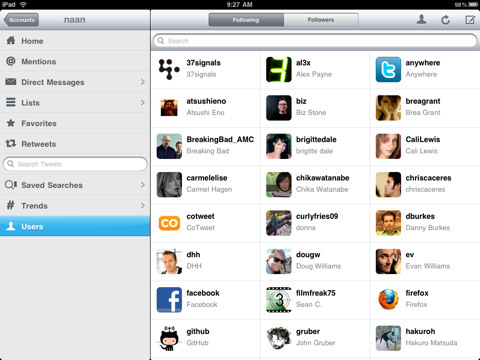 Twitepad is an iPad Twitter client that supports multiple user accounts and multiple columns on your screen. Your iPad screen will be divided by your Twitter columns and by your webbrowser. If you want to quickly open a few links from your Twitter friends have sent you, just tap at the links one by one, they will all be opened in a thumb view first and you can view the full website, when you just tap on the preview – no further loading is needed. This is the fastest way you ever read through your Twitter news. 1. Thumbview preloading: Ideal for websites like Google Reader, Alltop and many others.Tap on a link, and the corresponding website will be loaded in a small thumbview. 4. Echofon Pro for Twitter By naan studio, Inc.
Echofon Pro works both iPhone and iPad! Echofon is an easy to use, super-fast Twitter app for the iPhone and iPod Touch. This pro version works on iPad too! It is easy to do common Twitter tasks such as viewing your timeline, messages, replies, lists and favorites. Echofon has a powerful tweet-authoring where you can write tweets, take photos/videos and update your current location. When another Echofon user (iPhone or desktop) sends you a Direct Message or @reply, you can be notified instantly via push notification. Get your friends to use Echofon and you can send Twitter messages instead of SMS! You also can receive push notifications from users of other Twitter apps with this pro version. 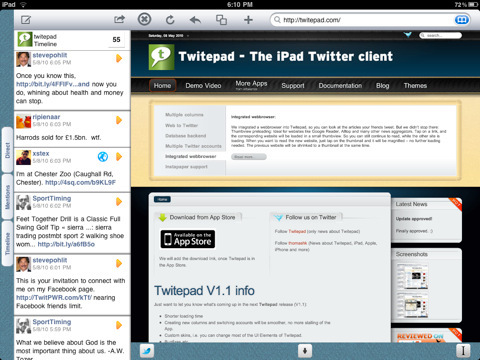 Tweeterena 2 for iPad is a brand new fully featured Twitter client designed specifically for the iPad’s large beautiful display. 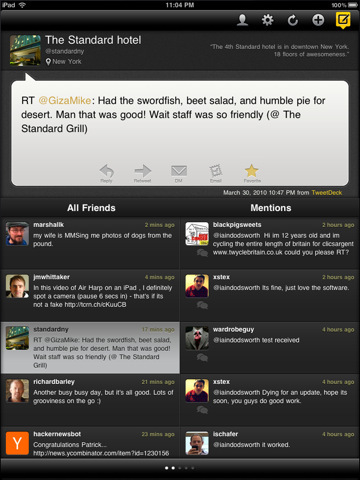 Tweeterena was hugely successful on the iPhone platform and we debut our second version here on the iPad. Tweeterena 2 for iPad makes use of the iPads gorgeous large display. It is clear and simple, making it a pleasure to read through your tweets. Like to do two things at once? TweetBrowser lets you keep up to date with the latest happenings on Twitter, while you surf the web in a fully featured, tabbed browser. [Now that we have a device to test on, expect a stability release very soon]. Your Twitter stream runs along the side, automatically updating with the latest updates. Easily reply or repost tweets, or open the links in the browser. This app includes a very capable, tab based browser that allows for easy switching between pages. Plus, you can keep bookmarks or review your history, right from within the app. ‘TweetTime for iPad’ is a full featured twitter client for iPad. – Supporting multiple twitter accounts. – Managing your twitter home, replies, direct messages and favorites. – Viewing other user’s timeline, favorites, and profile information. – Sending and receiving direct messages. – Uploading photos from your photo library. – Uploading your location with Google Map. – Built-in web browser to view web links. – Shows the number of new tweets when you log back in. – Supporting OAuth for Authentication for Twitter Server. – Saving draft of the tweet if you cancel composing tweet. And you can continue to compose it continuously when you re-composing tweet. – Official List Support. Create List, Delete List, Add users to your own list, and subscribe other users’ list. – Deleting tweets you posted. – Uploading medias support 2 different modes. And many more features are coming. 9. Twitter By Twitter, Inc. Discover what’s happening right now, anywhere in the world with the official Twitter for iPhone app. Realtime search, Top Tweets, trending topics and maps show whats happening now everywhere and nearby. Tweet, send DMs, share photos, videos and links to your friends and the world. Don’t have an account? Just sign up from the app! Automatic synching with Twitepad for iPad. When I am on the road I always hesitate to click on a link unless I am really sure it’s worth reading, because I stare at a white loading screen for a long time until the website finally appears. So Twitepad for iPhone loads the website in the background while you can still continue reading your Tweets. You can see the loading progress at the bottom of the screen. Once the site is loaded just tap on it and you can read it, without any further waiting.